Power and Energy are two essential inputs for economic development and improving the quality of life in India. 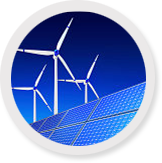 Development of conventional forms of energy for meeting the growing energy needs of society at a reasonable cost is the responsibility of the Government. This section focuses on the growth of both conventional and non-conventional form of energy in the country. Details of the schemes, policies, reports, statistics related to the sector are available. Special initiatives by the Union and state governments to promote the non-conventional/alternate/new and renewable sources of energy such as solar, wind and bio-energy, etc., are also mentioned.